With cloud storage rivals like Dropbox dishing out free space like it was going out of fashion, Google has announced that it will unify the storage between the Gmail and Drive services. The change means that instead of users having 10GB free storage in Gmail and a separate free 5GB in Drive, users will now just have the whole 15GB in one unified lump to be used where they need it. This may not sound like much of a good thing, but because many folks will have barely come close to reaching their 10GB Gmail storage, it means that they can use all that empty storage for their files in Drive. 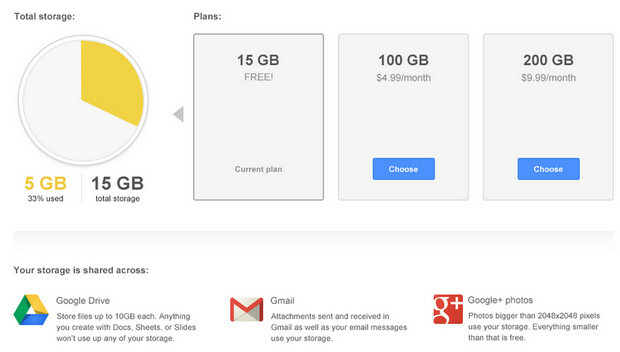 If the new deal proves to be insufficient for data-hogging types, Google will also offer competitive plans at $4.99/month for 100 GB, and $9.99/month for 200GB. Google will also soon be making updates to the Google Drive storage page, so users will be able to see how they’re using storage space.